February 2014 ~ Eat. Run. Rehabilitate. Swollen Knee? Try this on for size. "...Not your average taping course. Fascial Movement Taping Certification is a 2-part certification process led by industry leading experts in functional movement assessment and treatment. 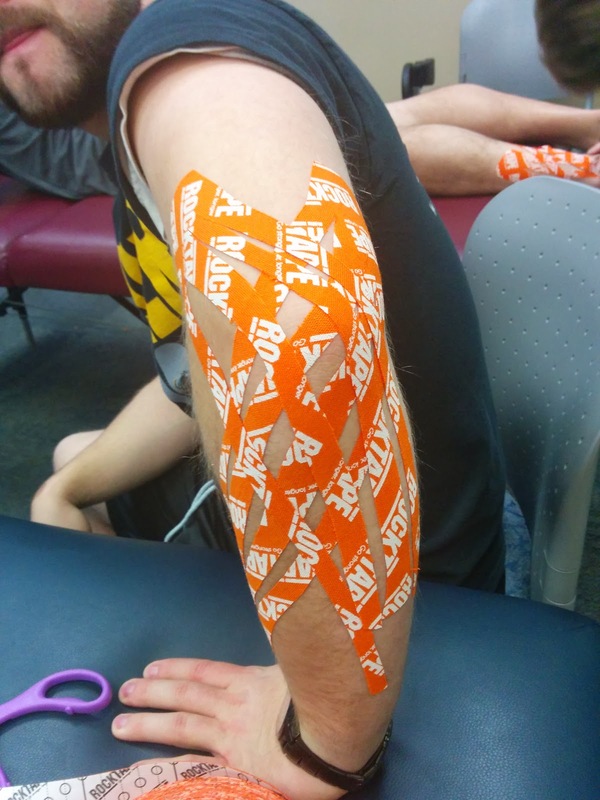 Fascial Movement Taping (FMT) is based on the obvious yet largely overlooked concept of muscles acting as a chain. Say good-bye to thinking about origins and insertions and memorizing directions of tape. Say hello to a framework of ‘taping movement, not muscles’." I was immediately attracted to what they were promoting ("Taping Movement, Not Muscles") and how they were separating themselves from the reductionist style of taping muscles via origin and insertion. So...I signed myself up for the most readily available seminar! I also noticed that Dr. Perry Nickleston, DC, FMS, SFMA, NKT was lecturing/teaching this conference. This excited me because I knew of his writings via his blog, Stop Chasing Pain, and I also knew that he was integrating this style of taping with movement assessments via the SFMA and FMS. Perfect. This seminar was hosted on the campus of the National University of Health Sciences in Lombard, Illinois. Both days the course started at 8:00am and while I usually like to arrive to things like this at least 20-30 minutes early I have to admit that I ended up being about 5 minutes late for this course. There were primarily two reasons for this, a fresh blanket of snowfall left us with undesirable travel conditions and I ended up getting lost on the campus due to the poor communication of the room location. Fortunately, it seemed as if the bulk majority of people got a little lost including Dr. Perry himself! Importance of and the interplay between the brain, skin, the nervous system, pain and the relationships with human movement. That is a lot of stuff to cover in just the first day alone but in reality so much of the different topics build upon one another and have a lot of interplay. Also, this is a rough outline of what Dr. Perry went over...in reality Dr. Perry jumped between topics, subjects and ideas at seemingly random times. Not because he was unorganized but because he wanted to promote critical clinical thinking that sometimes begins as unorganized and seemingly random observations. Skilled clinicians must then take these random puzzle pieces and turn them into something meaningful for both the patient and themselves. Dr. Perry also delivered the content with an energetic and interested tone. He wasn't the boring monotonous type but you could tell he had a vested interest into what he speaking about. While he did use colorful language at times it was definitely not tasteless and provided some much needed levity for when your brain started reeling from all of the knowledge bombs being dropped upon it. For this review I can't go into everything that I learned nor does anyone want to read that much about it. I also don't want to spoil all of what we learned but I would like to highlight some of the things that I really liked. Things were both practical and philosophical. In the morning when the conference had begun I had received a text message from one of my patient's (a collegiate basketball player) that their back was very stiff, painful and locked up. They were barely able to dress themselves because of this. This wasn't pleasant news considering I was 2 hours away at the conference and wouldn't be able to treat him until that night...even worse was that he had a basketball game to play that night at 7PM. However, one of my colleagues was going to travel with the team and prep them before the game. He was able to help treat him before the three hour bus ride began and when they finally arrived. The bus ride was reportedly miserable and the athlete had to stand up or lie in the aisle for the bulk of the ride. With 30 minutes to go before tip-off the athlete was better than that morning but still wasn't sure of his ability to perform. This is when I arrived to the game, I had been thinking of applying a tape job that I had learned that morning that involved taping the thoracolumbar fascia and the paraspinals for pain control and muscle spasm. I thought it was worth a shot and would hopefully work in synergy with the other various treatments he had received that day. I didn't have any Rocktape with me and just used some cheap kinesiotape from my kit(ended up starting to fall off halfway through the game). Nevertheless, the athlete reported that he felt much better and more comfortable with the tape and subsequently was able to play the entire game. Could this have been purely placebo? Possibly. Could it have been related to the prior treatments from my colleague? Absolutely. However, I don't care if it was just a placebo that made him able to perform...There was no downfall to trying and he wasn't suffering from an injury that should have removed him from participation. The entire experiences was a giant +1 for how I felt about what I was learning from the seminar. Potentially I am even biased because of this experience but pain is a construct and I was able to help alter how he assessed his status. "Treating scars is really cool s#^t!" "Movement is the common denominator of injury"
Your body is always training and working out...against gravity. "If you have a body, then you are an athlete." "...you need all of that s**t to be STABLE!" "If I change your posture, can I change your mood?" "You need to have blueballs if you want to stick out"
Go stronger, longer - It's viagra for the whole body. Because I already made a novel out of day 1 let me try and keep this short and sweet. While day 2 definitely was full of mental "sweets" it definitely did not come up short. Day 2 was more dedicated to assessing movement and then applying taping techniques in attempt to change movements. Applying the spiral chain tape job to one of my athletes. To start off Dr. Perry began with a segment on the importance of movement for life, how movement is a behavior, and how we all have our own unique movement habits or patterns. All things I whole-heartedly buy into and believe in. He then tied that part all together nicely by throwing this classic Gray Cook quote at us, "It took a habit to make that pattern, and it's going to take a habit to break the pattern." Dr. Perry then had a great slide where he compared using the Snellen Eye Chart as a vision assessment to using movement as an assessment. He stated that if you weren't able to read the letters he knew you needed corrective lenses and if you can't move well then you probably need corrective exercise. Albeit he admits that some people can't reach perfect, whereas some only need a tiny tweak. Maybe you don't like the SFMA or FMS...Doesn't matter, the importance of testing any motion that is used for ADL's or sport specific exercises is just as beneficial and vitally important. 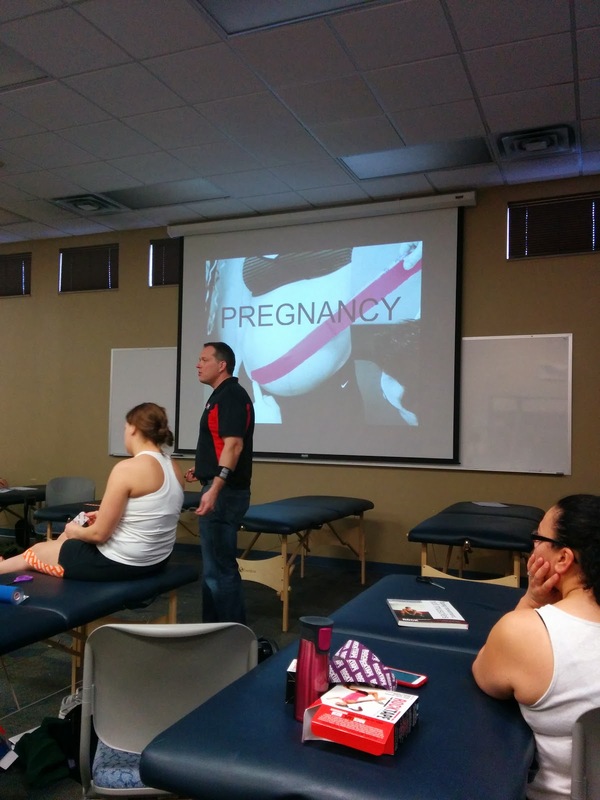 A nice tape application to assist pregnant women with low back pain, etc. We were not discussing abstinence, yet. There was a lot of SFMA/FMS type movement tests and many of Dr. Perry's own favorite movement tests thrown into this day. 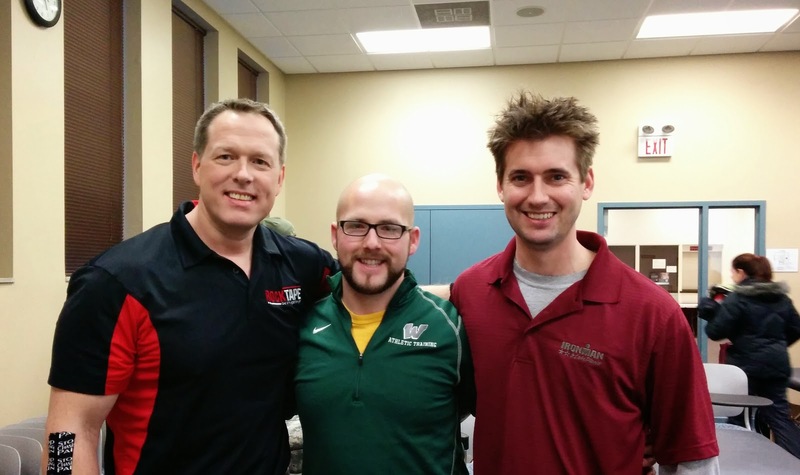 We discussed important aspects of the movements, potential compensations, movement lynchpins, and ways to approach correcting and taping said movements. There was a lot of moving and not a lot of sitting during this course. Here I used the "Big Daddy" 4 inch tape, for posture. Overall, I would say that I definitely enjoyed the course and I have found myself practicing a lot of what I learned in the clinic this past week. I don't think the tape is a be-all-end-all treatment and it is definitely not taught as one but it is another tool for the toolbox. I enjoyed the discussion and dissection of movement, nerves and the brain, and the implications of everything combined. Would I sign up again if I had to remake the decision? In an instant. Do I recommend it to others? Yes, but I feel like I definitely benefited from having previous exposure to the SFMA/FMS. There were a few massage therapists and personal trainers in the class and I couldn't help but wonder if they were able to digest everything as easily. "Pass your finger through the fuzz" - keep moving. "If you don't own breathing, you don't own movement"
Flip them over and tape their yang. Dr. Perry, Myself, and Dr. Nick...Both of them making me look tiny.